The most exciting part of the FireFly is the LED lights and the control panel. Fifteen four-color lamp assemblies are located around the entire airframe and enhance the lighting effect, plus adds strength to the structure. The control panel has four different color modes and can be switched from your radio using different channels. 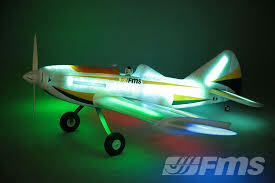 Let the Firefly's unique appearance, outstanding lighting effects, and pioneered technology lead you in a totally new and different flying experience, night flying.